The Keyauwee Indians, at the beginning of the eighteenth century, were living in a town surrounded by palisades located near the Uwharrie River in present-day Randolph County. Nestled in a valley surrounded by cornfields, their village was vulnerable to attack, and their numbers, according to the chronicles of John Lawson, were minimal. Shortly after Lawson's 1701 visit, the Keyauwee relocated. Joining with the Tutelo, Saponi, Occaneechi, and others in 1714, they briefly found shelter at Fort Christanna, an outpost and reservation established by Virginia's governor Alexander Spotswood. After a few years the Keyauwee left to join with the Saura (Cheraw) and the Peedee on the Pee Dee River in South Carolina, where they carried on a trade in deerskins with Charleston traders. The Keyauwee allied with their Indian neighbors in the 1715 Yamassee War against South Carolina, after which they joined other Siouan-speaking people in the Catawba Nation. James H. Merrell, The Indians' New World: Catawbas and Their Neighbors from European Contact through the Era of Removal (1989). Douglas L. Rights, The American Indian in North Carolina (1947). 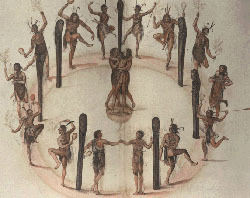 "Indians Dancing Around a Circle of Posts," watercolor by John White, created 1585-86." Image courtesy of the Trustees of the London Museum accessed via the Nation Park Service. Available from http://www.nps.gov/nr/travel/jamesriver/colonization.HTM (accessed May 23, 2012). 1 January 2006 | Green, Michael D.
Is there a field or place at or near Shepard mountian that I may walk and look for arrow heads?